What matters more when selecting multiple winners: overall support or minority representation? In previous posts, I discussed the biggest reason VoteUp uses range voting to collect information on voters’ preferences: expressiveness. As an aside, I mentioned that range voting fails the "Majority Criterion," which means that an option can be defeated even if it’s the first choice of the majority of voters. Although that may sound like a limitation of the voting system, it’s also a feature: it means that a minority of voters can avoid getting an option they really don’t like, even if they still don’t get their top choice. Today I’d like to talk about how minority representation works when your election can have more than one winner. As an example, suppose you’re a member of a club that occasionally gets together to play board games. Ten of your friends are coming to the next gathering, and there should be time to play about two games. They’ve asked you to help figure out which games should be on the schedule, so of course you turn to the just-released VoteUp app for Android to find a good answer. Your friends nominate five games: Settlers of Catan, Carcassonne, Dominion, Cards Against Humanity, and Say Anything. You create a poll with these options, and for simplicity you choose the "vote yes or no" option instead of the default "rate on a sliding scale". Technically, this means you’re using "Approval Voting". Approval voting is a special case of range voting that restricts the vote on every option to a "yes" or "no" answer. Although it’s somewhat less expressive than full range voting, it’s very similar in most respects. You may prefer it because it makes things a little simpler for your voters. We’re using it in this example just because it will make the math easier. It’s clear Settlers of Catan should be the first game you play: seven out of ten of you would like to play it, more than any other option. So, you form teams and get to colonizing that little island. You all have a great time until Lance and Nina steal a win at the end, leaving a slightly bitter taste in everyone else’s mouth. Now, what should you play next? Assuming you’re still willing to count Nina and Lance’s votes, you might look back at the results and decide Carcassonne should be your next choice. This makes sense: as the next most popular option, more people will be happy with it than any other option. However, there’s a hidden downside to this choice: if we look at the votes in detail we'll see that Ada and Shomace hang out with the group all night long but don’t get to play any of the games they wanted. In democracies, we try to design systems that provide some representation for minorities because we believe majority rule alone isn’t enough to produce a stable, happy society. With a small group of friends, we have a much simpler reason to avoid excluding the minority vote -- they’re our friends and we want them to have fun so they keep hanging out with us! So what’s going on here, and how else could we choose our next game? It helps to notice that the games we’re choosing from can be divided into two categories. 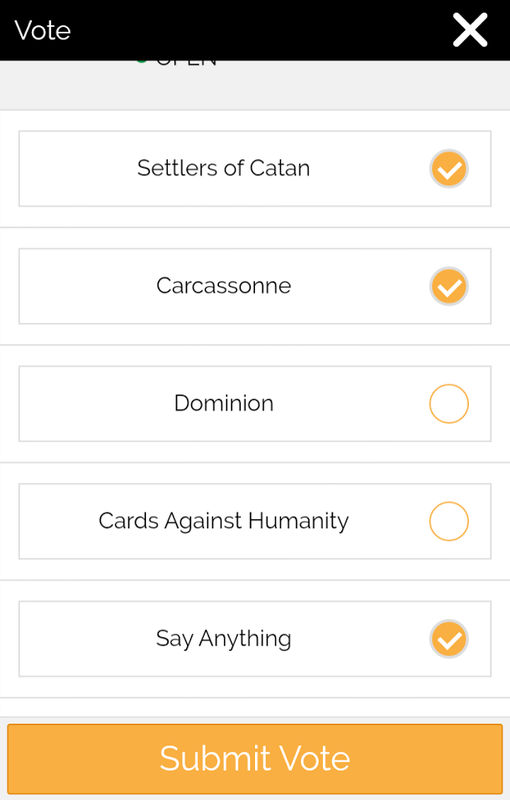 Settlers of Catan, Carcassonne, and Dominion fall into a "strategy" category, while Cards Against Humanity and Say Anything fall into what we might call the "party" category. If you look at the votes closely enough, you’ll see that there’s a majority of voters who prefer the strategy category, and a minority who prefer the party category. Because approval voting allows the strategy group to vote for all or most of the strategy games, the strategy games all come to the top. With the new system, you’d choose Say Anything as your second game, and at the end of the night everyone would get to play a game they had chosen. How would this work? Well, Nina, Shomace, and Ada had stronger votes since they were excluded from the first round, so with a little help from Chris and Lance they would be able to shift the vote to the "party" side. 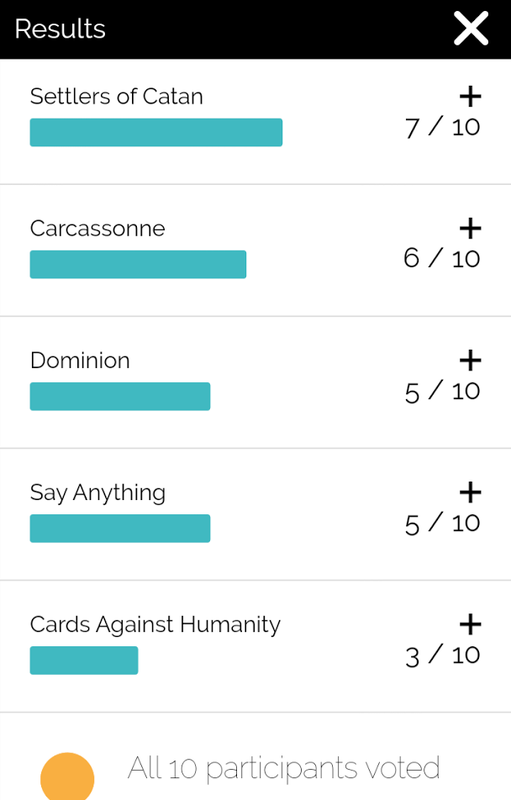 In the end, you’d play a slightly less popular game (five initial votes for Say Anything vs six votes for Carcassonne) in exchange for including everyone. Although sequential proportional approval voting is a little complicated to tally up by hand, it’s exactly the sort of problem that computers are great at solving. We’re considering adding proportional approval voting support to VoteUp, and making the changes in our software would be easy. The hard part for us would be making the feature intelligible enough to our users that they’d actually want to use it. Our great hope is that over time software like VoteUp will familiarize more people with voting methods that are superior to today’s plurality vote, and eventually lead to better, more inclusive decision making across all of society. For now, it’s enough of a challenge to build just one small app that makes decision making in small groups a little faster and easier!